Kenmare News | Christmas Day fundraiser goes swimmingly! Christmas Day fundraiser goes swimmingly! 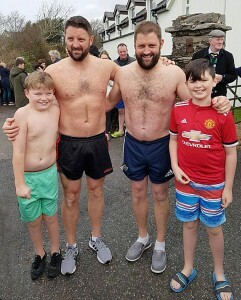 A Christmas Day swim, organised by Kieran O’Shea and his wife Sophie from Bonane, in aid of Kenmare Mental Health Association took place at Kenmare Pier on Christmas Day. About seventy people took part in the swim and €810 was raised for the Kenmare branch of Kerry Mental Health Association. It was the second year of what will hopefully become an annual event. and Kieran would like to thank everyone who attended (whether they got wet or not) for their generous contributions, it was good craic and for a great cause. All money raised for Kenmare Mental Health Association goes towards supporting clients of KMHA. It supports various social events, classes and activities for clients at Fiachne Day Centre and clients in the community as requested by the local Community Mental Health Nurse, and hampers and lunch vouchers are given to clients at Christmas by KMHA as requested by the CMHN. A further fundraiser was organised by Peter Crowley of Crowley’s Bar for Kenmare Mental Health Association and our local branch of St Vincent de Paul. Peter hosted the musical fundraiser on Friday 14th of December, and €3,050 was raised, with each charity receiving half the proceeds of the night. Many thanks to Peter Crowley, the musicians and DJ and to all who supported the event. This is the second year Peter has supported these two very deserving charities with his musical fundraiser, which will hopefully become an annual event.